Tasco Spotting Scopes are designed especially for birding and wildlife observation. Quality coated optics in Tasco Spotting Scopes give crisp, clear views. Tasco Spotting Scopes have excellent eye relief, large exit pupils and a quality tripod offer hours of comfortable, steady viewing. 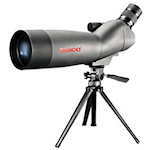 Tasco World Class spotting scopes a very affordably priced zoom spotting scopes designed for birding. World Class scopes come with 20-60x zoom eyepieces and either 60-mm or 80-mm objective lenses in both angled and straight configurations. World Class spotting scopes are sold in kits including a hard case and a convertible window mount/table-top tripod.